I am thrilled to share that my first social media marketing seminar was a great success. The planning and coordination was impeccable thanks to the professional staff at the African American Chamber of Commerce. The attendance was impressive; including a variety of industries from banking, audio/visual/technology, leadership/talent development consultants, education, auctioneers, real estate/mortgage professionals, insurance, and a book author - to name a few. The response was so motivating and I am truly pleased to have followed through on this presentation. It was great to hear that the information was helpful, and that it was great to feel that the information and stories I shared may help an inspiring group of entrepreneurs and passionate professionals. After practicing my presentation many times, my key messages finally jumped out at me - YESTERDAY - the day before my presentation. The three things that I wanted my audience to remember are to dive into the social media world with a strategy in place, to focus more on the quality of their social media marketing efforts and messaging, and less on the quantity they are reaching (or not reaching), and to persevere with patience. Why? When clients express frustration about how overwhelming social media is, or how they are not getting results, or how time consuming it is - I find that this is usually because they haven't worked at developing a detailed and workable plan of action, or setting workable goals. Many times they haven't identified a specific target profile, nor have they researched how information flows in their respective industry. Yes, this is work, but it is the necessary work to ensure that your efforts are progressive. So I equipped them with 7 STEPS TO BUILD A SOCIAL MEDIA MARKETING STRATEGY. Many couldn't wait until I host a follow-up seminar where I go through building a social media campaign - or the HOW. And I can't wait to present the HOW. However, I want to emphasize that you must go forth with a strategy to avoid burn out, disappointing results, and missing out on a great opportunity to really market your business - before you get to the HOW. Another tool that I pushed during the presentation is to build an EDITORIAL CALENDAR. This is a life saver, motivator, and pain reliever all in one. Your editorial calendar allows you to map out an entire year's worth of messaging; everything from themes to topics, to content providers, and frequency of postings. Whether it's for a blog, a group you've created on LinkedIn, or discussions on Facebook - having an editorial calendar allows you to paint a chronological picture of what you are going to say, share, announce, and inform your audience about. It will allow you to determine if it's too ambitious, if you need to outsource your campaign, if it's underwhelming, etc. 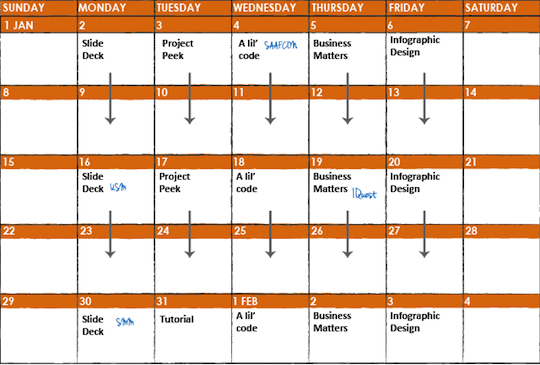 An editorial calendar will help you provide quality content. 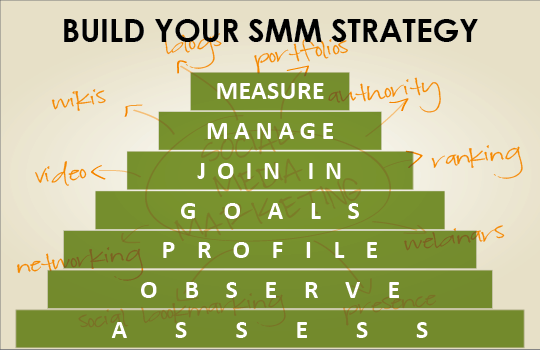 Having goals also helps you implement a quality strategic marketing campaign because you will be more focused. It's not about saying 2,000 different things to 250 million users. 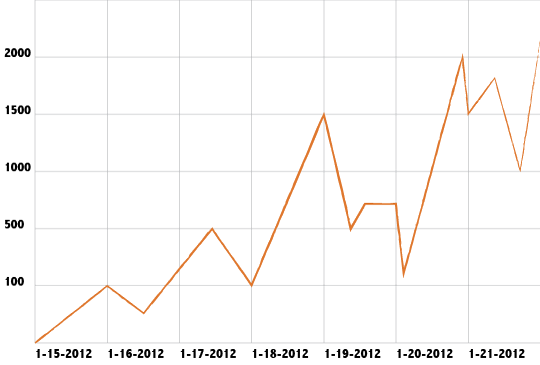 It may be more about sharing and evolving a few key messages 2,000 times to 100 users (your dream clients). Why perseverance? When you implement any marketing campaign you must factor in that you will not get immediate results. The same holds true for social media marketing. Yes, people are online all day, every day. However, it doesn't mean that you will get immediate feedback when you put something out into the world wide web. With social media, you have to be proactively patient. Meaning, that as you are review your metrics, and they are not ideal numbers, you have to put on your analytical/imaginative hat and identify what you can do get more desirable results. This does not mean throwing the plan in the trash. This means taking your metrics, studying what's working, what's not working, and what is showing potential; going back to your editorial calendar and tweaking the messaging. You may have to do this over and over again, but it's easier now because you've already done all the hard work of setting it all up. Social media is powerful. Social media has made marketing accessible to many more entrepreneurs. Social media is now an essential tool that should be a part of your marketing plan. Build your strategy. This is quite an endeavor but it is well worth the effort, and is actually a great opportunity to address gaps in your business, to be frank with yourself about what you have to invest to get it done, and to commit and follow through on something that is beneficial for you, your team and your business. I will be sharing the slides of the presentation soon, so stay tuned!